For other uses, see Arsinoe (disambiguation). Coin of Arsinoe II struck under the rule of her husband-brother Ptolemy II Philadelphus. Head of Ptolemy II Philadelphus with Arsinoe II behind. The Greek inscription ΑΔΕΛΦΩΝ means "[coin] of the siblings". Arsinoë II (Koinē Greek: Ἀρσινόη, 316 BC – unknown date between July 270 and 260 BC) was a Ptolemaic queen and co-regent of the Ptolemaic Kingdom of ancient Egypt. Arsinoe was queen of Thrace, Anatolia and Macedonia by marriage to King Lysimachus (Koinē Greek: Λυσίμαχος) and co-ruler of the Ptolemaic Kingdom with her brother-husband, Pharaoh Ptolemy II Philadelphus (Πτολεμαῖος Φιλάδελφος "Ptolemy the Sibling-Loving"). Arsinoe was given the unprecedented Egyptian title "King of Upper and Lower Egypt", marking her as a full pharaoh. Arsinoë was the first daughter of Pharaoh Ptolemy I Soter (Greek: Πτολεμαίος Σωτήρ, "Ptolemy the Savior"), founder of the Hellenistic state of Egypt, and his second wife Berenice I of Egypt. She was born in Memphis, but was raised in the new city of Alexandria, where her father moved his capital early on. Nothing is known of her childhood or education, but judging from her later life as patron of scholars and noted for her learning, she is estimated to have been given a high education. Her brothers where tutored by intellectuals hired by their fathers, and it is regarded likely that she attended these lessons as well: she corresponded with the intellectual Strato of Lampsacus later in life, and he may have previously been her tutor. At about age 15, Arsinoë married King Lysimachus (who was then around 60 years old), with whom she had three sons: Ptolemy Epigonos, Lysimachus, and Philip. In order to position her sons for the throne, she had Lysimachus' first son, Agathocles, poisoned on account of treason. Arsinoe reportedly paid for a rotunda in the Samothrace temple complex, where she was likely an initiate. After Lysimachus' death in battle in 281 BC, she fled to Cassandreia (Κασσάνδρεια) and married her paternal half-brother Ptolemy Keraunos, one of the sons of Ptolemy I Soter from his previous wife, Eurydice of Egypt. The marriage was for political reasons as they both claimed the throne of Macedonia and Thrace (by the time of his death Lysimachus was ruler of both regions, and his power extended to southern Greece and Anatolia). Their relationship was never good. As Ptolemy Keraunos was becoming more powerful, she decided it was time to stop him and conspired against him with her sons. This action caused Ptolemy Keraunus to kill two of her sons, Lysimachus and Philip, while the eldest, Ptolemy, was able to escape and to flee north, to the kingdom of the Dardanians. She herself sought refuge in the Samothrace temple complex, which she had benefited during her tenure as queen. She eventually left from Samothrace for Alexandria, Egypt, to seek protection from her brother, Ptolemy II Philadelphus. It is not known which year she left for Egypt. She may have left so early as 280, directly after the murder of the younger sons, or as late as 276, when the claim of her eldest son to the Macedonian throne had clearly failed after the succession of Antigonus II Gonatas. In Egypt, she is believed to have instigated the accusation and exile of her brother Ptolemy II's first wife, Arsinoe I. Whether this was actually true is unknown: it is not known which year she arrived in Egypt, and her sister-in-law may already have been exiled at that point, or her divorce may have taken place without her involvement. Whatever the case, after the divorce of Ptolemy, Arsinoe II then married her brother. As a result, both were given the epithet "Philadelphoi" (Koinē Greek: Φιλάδελφοι "Sibling-loving (plural)") by the presumably scandalized Greeks. The closer circumstances and reasons behind the marriage is not known. Her role as queen was unprecedented in the dynasty at the time and became a role model for later Ptolemaic queens: she acted alongside her brother in ritual and public display, became a religious and literal patron and was included in the Egyptian and Greek cults created by him for them. Sharing in all of her brother's titles, she apparently was quite influential, having towns dedicated to her, her own cult (as was Egyptian custom), appearing on coinage and contributing to foreign policy, including Ptolemy II's victory in the First Syrian War between Egypt and the Seleucid Empire. According to Posidippus, she won three chariot races at the Olympic Games, probably in 272 BC. 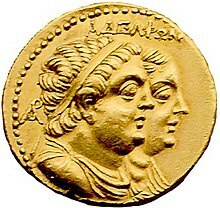 After her death, Ptolemy II continued to refer to her on official documents, as well as supporting her coinage and cult. In establishing her worship as a goddess he justified his own cult. ^ Donnelly Carney, Elizabeth (2013). Arsinoe of Egypt and Macedon: A Royal Life. Oxford University Press. p. 115. ISBN 978-0-19-971101-7. ^ "Did female Egyptian pharaoh rule before Cleopatra?". MSNBC. December 2, 2010. Retrieved 2010-12-05. ^ a b c d e f g h i Elizabeth Donnelly Carney (2013). Arsinoe of Egypt and Macedon: A Royal Life. New York: Oxford University Press. ISBN 978-0-19-536551-1. ^ Carney, Elizabeth Donnelly (2013). Arsinoe of Egypt and Macedon: A Royal Life. OUP USA. p. 31. ISBN 978-0-19-536551-1. ^ "Ptolemy "the Son"". www.tyndalehouse.com. Retrieved 2018-03-19. ^ Posidippus, P. Mil. Vogl. VIII 309, AB 78. ^ Donnelly Carney, Arsinoe of Egypt and Macedon: A Royal Life, pag. 142. Elizabeth Donnelly Carney (2013). Arsinoe of Egypt and Macedon: A Royal Life. New York: Oxford University Press. ISBN 978-0-19-536551-1. Milan Papyrus, P. Mil. Vogl. VIII 309. P. McKechnie and P. Guillaume (eds) Ptolemy II Philadelphus and his World. Leiden, 2008. M. Nilsson, The Crown of Arsinoë II: The Creation of an Image of Authority. Oxford, 2012. D. L. Selden, Daniel L. "Alibis". Classical Antiquity 17 (2), October 1998. Wikimedia Commons has media related to Arsinoe II.